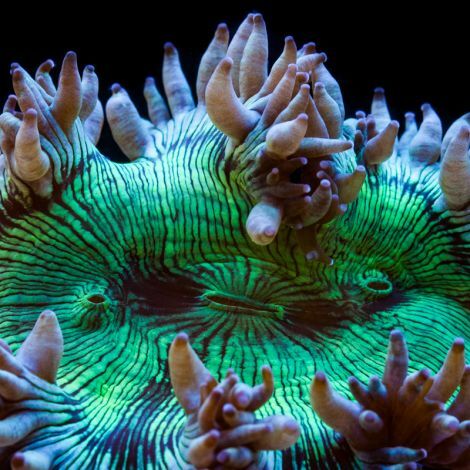 Elegance Corals of the Genus Catalaphyllia are an LPS or large polyp stony coral with a mixed track record in the reef aquarium hobby. Reefkeepers may have wildly different experiences with this coral depending on where their specimen was collected. Indonesian Elegances used to be stout aquarium inhabitants, but lately, Catalaphyllia collected from that geography succumb to a mysterious disease. We at Tidal Gardens believe many of the issues with Indonesian Elegance corals can be avoided by purchasing Australian Elegance corals. The Aussie Elegances have shown themselves to be very robust and easy to care for. They are practically bullet proof. As a side note, Elegances happen to be one of the corals that got me into the hobby into the first place. People often ask what is my favorite coral, and I can never pick out just one, however the Elegance Coral is always on my short list. Please check back occasionally if you are looking for rare Elegances.